Ender Inciarte is an All-Star, Freddie Freeman's transition to third base is underway in Triple-A ... and there's growing talk of a 1991 replay in Atlanta with the Braves a game under .500. Taking stock of the week that was, and a daunting few weeks to come. 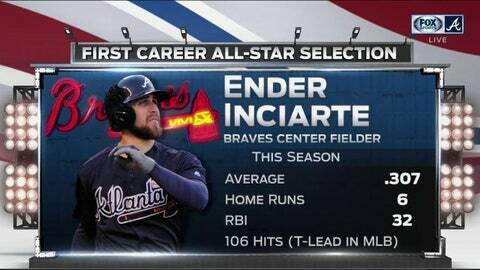 The Braves had a number of serious candidates to make the All-Star Game in Miami, but considering the first half Ender Inciarte has put together, he was the most logical -- and arguably the most deserving -- Atlanta representative. A notoriously slow starter, with a career average of 62 wRC+ in the first half compared to 117 in the second half, Inciarte is at 97 after Sunday's game in Oakland. He's been at his best in May and June, with 115 and 105 wRC+, respectively, and is now up to 106 hits after going 3 for 5 vs. the A's. That's the most of any Atlanta player since Freeman's 108 in 2014 and it's realistic that with six games to go, he can finish second to Martin Prado's 121 in 2010, which is third-most in franchise history. Only the Phillies' Odubel Herrera -- at 10.7 -- has a higher defensive WAR than Inciarte's 10.6, but we're seeing a complete player now in Inciarte, who has added to that Gold Glove D with vast offensive improvement. After hitting .227 against lefties his last season with the Diamondbacks, Inciarte was at .319 vs. southpaws in 2016 and is at .333 this season. That first-half hits total so far has Inciarte tied for the most in the majors, putting him alongside the Rockies' Charlie Blackmon, who is joining him in Miami. The other candidates, Matt Kemp, Brandon Phillips and even the rehabbing Freeman had arguments, but Tyler Flowers has a legitimate gripe for not making it. The Cardinals' Yadier Molina received the reserve catcher spot behind the Giants' Buster Posey. But Molina is 31st in on-base percentage among catchers (.308) to Flowers' (.413), which is third, Flowers is also hitting .319 to Molina's .273 and has a 136 wRC+, while Molina is at 86. And if we're judging from the defensive side of things, Flowers remains the game's best pitch framer, with an MLB-best 19.7 runs above average. Molina is at 0.1. Plus, St. Louis, which is two games below .500, already has pitcher Carlos Martinez. But, let's face it, Molina has the kind of name recognition that Flowers can't match and has become this era's standard for play at the position. Inciarte, though, is a deserving All-Star for the first time, and making him the first Atlanta center fielder to earn that nod since Michael Bourn in 2012. 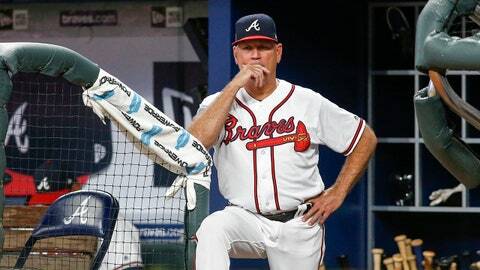 The chatter during Sunday's Braves LIVE pregame and Joe Simpson's comments in the open of the game itself set the stage. Could Atlanta -- which sits at 40-41 and seven games back the National League East and 6 1/2 in the Wild Card race (as of this writing) -- actually make a playoff run? You can find your parallels for a Worst to First redux, considering that in 1991 the Braves entered this point of the season at 40-40 and 8 1/2 games in the NL West before going on their 55-28 run to win the division and, ultimately, reach the World Series. Going from the basement to the penthouse has happened 13 times in MLB history, but ... PUMP. YOUR. BREAKS. The Braves are about to enter a stretch that will may decide just how real this June/July surge -- winning 17 of the last 28 games -- really is. Tuesday at SunTrust Park, Atlanta opens a stretch of the Astros (two games) and Nationals (four) to end the first half of the season, then follows that with the Diamondbacks (three), Cubs (three), Dodgers (four) and then Arizona again for three more. That's 19 games against three current division leaders (Houston, Washington and Los Angels), three with the current Wild-Card leaders (Arizona) and Chicago, which is two back in the NL Central and 6 1/2 out of the Wild-Card hunt. At no point in the rest of the season will the Braves face back-to-back series against teams who are .500 or better, but now they're about to get SIX of them. This is Atlanta's proving ground, and if they can get to the start of the July 28-31 series against the Phillies still within shouting distance of the Nationals -- which during the Braves' tough stretch faces the Angels (a game over .500), Arizona, NL Central-leading Milwaukee and Colorado (currently the second Wild-Card team) -- things could get truly interesting with the trade deadline looming. But any thought of a run sits with a pitching staff that has the sixth-worst ERA in the majors (4.83) and fourth-worst at home (4.78). The first six games of the second half are, of course, at SunTrust. If all goes well, the Braves could get their two-time All-Star -- who was playing at an MVP level with 203 wRC+ before he fractured his wrist May 17 -- back in time for the Nationals series to end the first half. He looked adequate in his first game action for Triple-A Gwinnett in Charlotte at the new position, taking a slow roller hit to him in the second inning for the third out and tipped his cap to the crowd on his way to the dugout. It's going to be an adjustment, both for those watching and Freeman himself, as he told FOX Sports South's Kelsey Wingert. "I was a little uneasy, to be honest, the first couple of innings. 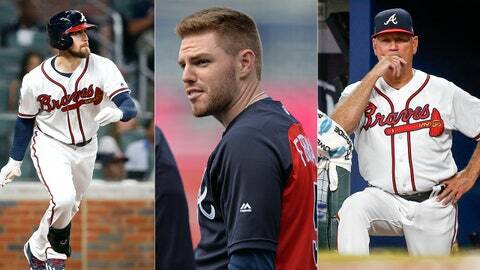 But once I got that first ground ball, it kind of all went away," Freeman said. "I felt good. I don't know if I'm ever going to feel like I do at first base, but I felt good enough." He had two at-bats, striking out and drawing a walk before the game was suspended after four innings. Freeman did not play Sunday, and will play the full game in Monday's series finale. He'll then continue his rehab stint in Gwinnett beginning Tuesday vs. Norfolk. "The big test was the first at-bat," Freeman said. "I wanted to go out there swing a lot and I swung three times. Didn't hit any of them, but I was really excited my first at-bat and it was good to just get out there and as the game went on, the more (the wrist) warmed up more and that was a good thing for me." If there's no soreness, Freeman could make his return to Atlanta for that July 6-9 set vs. the Nationals, or he could take those days and the All-Star Break off to come back to start the second half against Arizona. 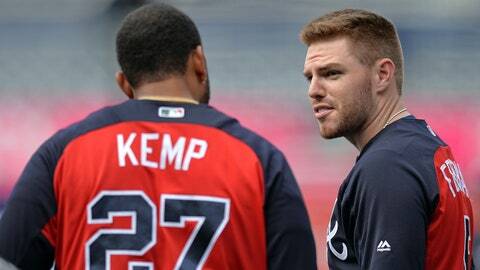 Regardless, Atlanta is on the verge of getting back a guy who still leads them in homers (14), despite playing 30 less games than the two guys on the team closest to him (the Matts, Adams and Kemp, with 12 each). Either at the beginning or in the midst of that grueling stretch, that's a lift bigger than anything the Braves could acquire at the deadline ... which is only going to fuel those rumblings of a Worst to First sequel.